FILE - An ethnic Uighur man looks on at the cemetery surrounding the tomb of Imam Asim in the Taklamakan Desert outside the village of Jiya near Hotan, Xinjiang Uighur Autonomous Region, China, March 21, 2017. Most Uighurs live in China's autonomous region of Xinjiang, the country's largest region. Xinjiang is strategically important to China, as it borders eight countries — Mongolia, Russia, Kazakhstan, Kyrgyzstan,Tajikistan, Afghanistan, Pakistan, and India. As demographics change, activists say the Uighurs' ability to engage in business and cultural activities has been gradually curtailed by the Chinese government. They also say the government places severe restrictions on Islam, branding ordinary Muslim traditions as religious "extremism" in order to curtail them. 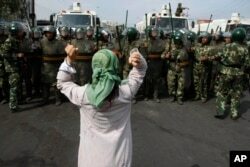 Since then, human rights groups have accused China of putting a million Uighurs in detention camps. China says it has put Uighurs in "vocational education centers" to stop the spread of religious extremism and to halt a surge in terrorist attacks. Critics of the Chinese policy say the measures are aimed at destroying Uighur identity.